Congolese authorities last weekend approved clinical trials for four experimental Ebola treatments in the Central African nation. According to local media, health workers have already administered therapeutic treatments to more than 150 Ebola patients since August. The treatment will be free of charge, the health ministry said in a statement. “Precious information about the effectiveness of the treatments obtained during the clinical trial will allow for the development of these treatments” the ministry added. As of last weekend, 151 patients had received one of the four drugs. Of those, 76 had recovered, 44 had died and 31 were still hospitalized. 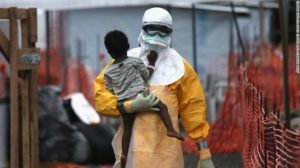 While there is no licensed vaccine to fight the Ebola virus, the World Health Organization (WHO) said the Ebola vaccine in question had performed well in a clinical trial in Guinea. This is the eighth outbreak of Ebola in the sub-Saharan nation, and the second since an epidemic in West Africa killed over 11,000 people. WHO said the risk of the outbreak spreading to neighboring countries remains “very high” but it does not recommend travel restrictions. The virus was discovered near the River Ebola in 1976 in the northern part of the country, when it was known as Zaire. The deadly virus is spread by contacting body fluids. It causes internal and external bleeding and impaires kidney and liver function. Posted by Steven Addamah on November 26, 2018. Filed under Zoom. You can follow any responses to this entry through the RSS 2.0. Both comments and pings are currently closed.